Livehoods is an interesting research project from the School of Computer Science at Carnegie Mellon University which maps social networking activity and patterns using tweets and check-ins to examine the hidden structure of cities and neighborhoods. For example below on the map each point represents a check-in location. Groups of nearby points of the same color represent a Livehood. Within a Livehood statistics are calculated aggregating check-ins overtime and depicts how a place is used. For more information on Livehoods click here. 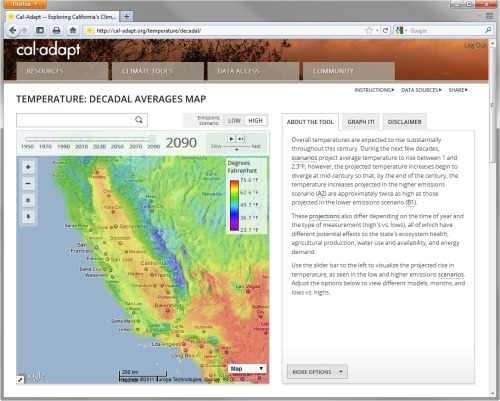 New 2011 SOD Confirmations Added to OakMapper! New confirmed cases of Sudden Oak Death (SOD) (P. ramorum) have been added to OakMapper, a project that tracks the spread of Sudden Oak Death from data collected by citizens and organizations. All official SOD cases are collected and confirmed by the California Department of Food and Agriculture or the University of California. Community SOD cases are submitted by citizens via the OakMapper website and iPhone application. 621 new points collected in 2011 have been added to OakMapper bringing the total number of confirmed SOD locations to 2191. The new data consists of laboratory confirmed cases collected by the annual SOD Blitz campaign of 2011 from the Forest Pathology and Mycology Lab run by Dr. Matteo Garbelotto. Click on the image below to view a close-up of the new confirmed SOD data (in green) from the SOD Blitz 2011. Explore the new data online here. An interactive web-based map called The New York City Solar Map was recently released by the New York City Solar America City Partnership, led by Sustainable CUNY. The map allows users to search by neighborhood and address or interactively explore the map to zoom and click on a building or draw a polygon to calculate a number metrics related to building roof tops and potential solar power capacity including: potential energy savings, kilowatt output (in a time series), carbon emission reductions, payback, and a calculator for examining different solar installation options and savings with your utility provider. The map is intended to encourage solar panel installations and make information regarding solar panel capacity easier to access. Lidar data covering the entire city was collected last year and was used to compute the metrics used to determine solar panel capacity. Solar Energy CalculatorThe data reveals that New York City has the potential to generate up to 5,847 megawatts of solar power. The installed solar capacity in the US today is only 2,300 megawatts. 66.4 percent of the city’s buildings have roof space suitable for solar panels. If panels were installed on those roof tops 49.7 percent of the current estimated daytime peak demand and about 14 percent of the city’s total annual electricity use could be met. This map showcases the utility and power of webGIS and how it can be used to disseminate complex geographic information to anyone with a browser, putting the information needed to jump start solar panel installation in the hands of the city’s residents. The map was created by the Center for Advanced Research of Spatial Information (CARSI) at CUNY’s Hunter College and funded primarily by a United States Department of Energy grant. Source: Click here for a NYTimes Article on the project for more information. Click here to view the New York City Solar Map.